The Colonists had chased General Cornwallis out of North Carolina. Cornwallis was looking for a place where the British Navy could come and pick him up. He had also received orders to build forts in the Virginia Tidewater area. He chose as his building site the village of Yorktown. 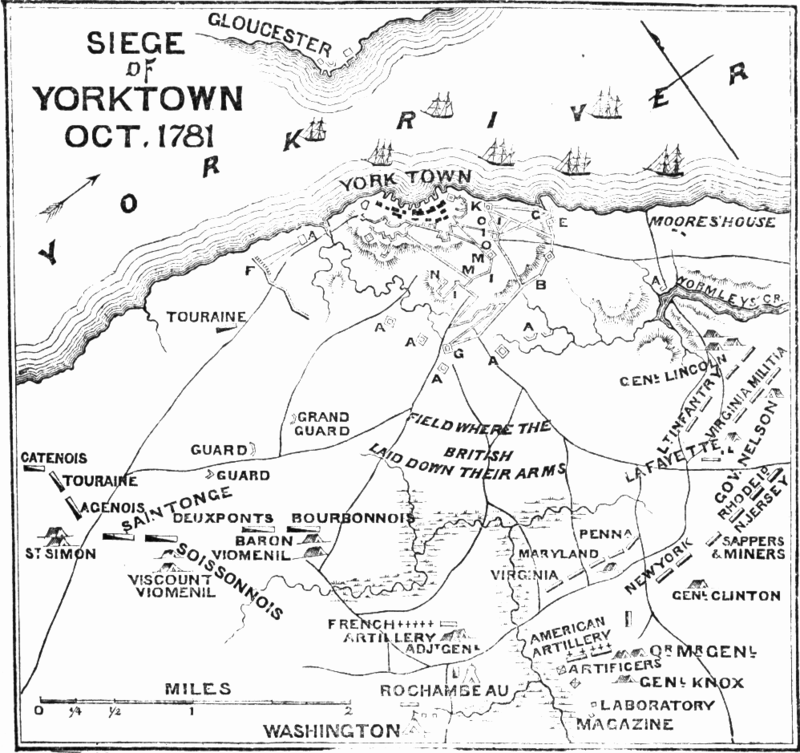 Look at the map and follow the route of Cornwallis From Wilmington, North Carolina to Yorktown, Virginia. This map was created by the National Parks Services and is in public domain. While Cornwallis was moving into Virginia, the Colonial Army under General Nathanael Greene recaptured all of North Carolina. Cornwallis could not go South. Another Colonial Army under the command of General Lafayette was moving south from Pennsylvania and Maryland. Cornwallis could not go north or west. The only way out for Cornwallis was out to sea. General Cornwallis was confident that the British Navy would be able to pick him up so he moved his army to the Forts he had built at Yorktown. The war would continue for another two years, but there was very little fighting as the two sides negotiated a peace treaty. On Sept 3, 1783 the Treaty of Paris was signed officially ending the war. Now that the war is over what do you think the colonists will do. Will they remain together? What will the new country be like? Write down what you would have done if you had been in power at the end of the war.